Going to the province of Batanes is really expensive. Imagine the regular cost of airfare from Manila to the island province is more than Php10,000 (roundtrip). It's a generally more expensive than other local destinations and other Asian countries. So, the most crucial part in your dream destination is to find cheap plane tickets. Always remember the virtue of patience. For sure airlines will offer ticket promo from Manila to Batanes. You just need to wait the SALE on their website. 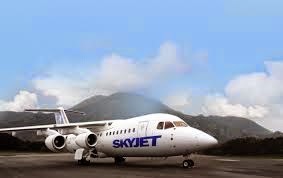 One of the airline companies in the Philippines that offer flights, Manila to Batanes is Skyjet Airlines. It has limited flights going to Basco Batanes. Philippine Airlines via Pal Express also offers flights going to Batanes. It uses the 76-seater Bombardier Q400 turboprop aircraft, which operates in NAIA Terminal 3. The flight, 2P084, operates every Monday, Wednesday and Friday. SEAIR also offers flights, Manila to Batanes. If you find a Manila to Batanes' (Roudtrip) plane ticket for less than Php 5,000. Grab it immediately. Mostly, the promo will last a couple of minutes because it's easily to get fully booked. Remember, not only you are waiting for the promo, a lot of travelers and outdoor enthusiasts are waiting for it. Book it as quick as you can. Don't loose hope! If you're having a hard time to find airfare promo, it's time to save money. Invest on your travel. For sure, on that way, you would be able to explore the beauty of Batanes.